Olivetan monastery of SS. Michele e Niccolò at Villanova-Sillaro (near Lodi); Abate Luigi Celotti (sold Christie's London, 26 May 1825, lot 15); Mrs. John B. Northrop, Cold Spring Harbor, NY; purchased from Mrs. Northrop on the Acquistions Fund 31 May 1995. Ms. antiphonary single leaf (cutting); written and illuminated in Italy, probably Milan, ca. 1500. 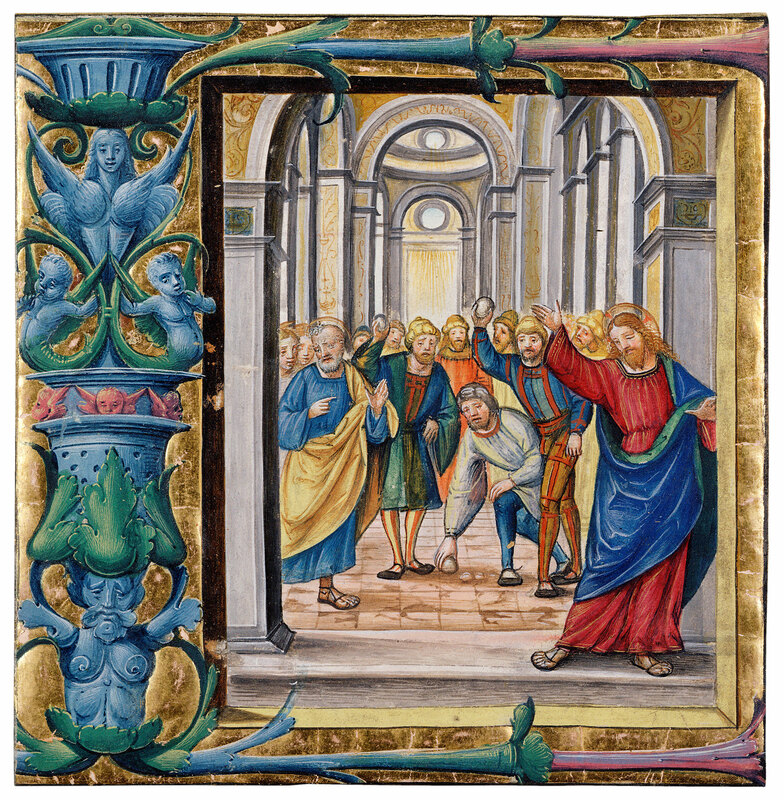 Decoration: 1 historiated initial I(ste sunt dies) for the first Matins response for Passion Sunday, depicting Christ about to be stoned by townsmen at the threshold of a synagogue; Italian Renaissance style. Text: on verso: Die si vocem Domini Nolite o; the historiated initial I(ste sunt dies) opens the first Matins response for Passion Sunday. M.1090, cut from an antiphonary and M.725, cut from a gradual, probably come from the same set of choir books commissioned for the Olivetan monastery of SS Michele e Niccolò at Vilanova-Silaro (near Lodi). Musical notation: 4-line red staves, square notes. Artist: Master B. F., sometimes identified as Francesco Binasco. Although many cuttings come from Graduals, this example comes from an Antiphonary, as the verso contains part of the music for the Passion Sunday office. In Graduals the Introits are illustrated, while in Antiphonaries it is the responses for the first lesson. The initial I (of Isti) begins the first response: Isti sunt dies (These are the days). Here, however, the initial illustrates the third lesson, from the Gospel of John (8:46–59). During a dispute in the temple the Jews accused Jesus of being a "Samaritan and having a devil," asking if he was greater than Abraham. When he responded that "before Abraham was made, I am," they were angered and tried to stone him, but Jesus hid himself and left the temple. The leaf was lot 15 in the landmark Celotti sale held at Christie's in 1825.